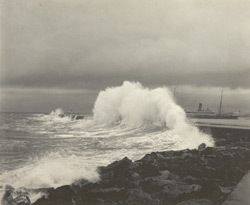 Photograph showing heavy seas striking the breakwater in the harbour in Colombo, the capital of Sri Lanka (Ceylon), taken by A.W.A.Plâté & Co. in c.1900. In 1796, the British occupied Colombo and put an end to 140 years of Dutch rule. Colombo became the capital of Ceylon and the modern town and harbour were developed under British rule. In the second half of the 19th century major works were undertaken, such as constructing of breakwaters in the harbour, to effect the transformation of Colombo into a significant port. It became the island's main port and commercial centre, surpassing Trincomalee and Galle both of which were natural harbours.